This post should probably come in two parts, but here is just one as I will mostly forget about the grocery store. Upstairs, and around the corner back towards the windows, a small little joyful universe exists with delicious foods, friendly people, and south Asian soundtracks playing in the background. It had been a long time since my last visit, so I decided to let the proprietor guide my way, and he immediately started pulling out the spoons for some sampling. I thought his first two picks were delicious, so my plate of three items ($8.99) was complete with these and some falafel. I especially loved the mujaddara, something of a specialty of the house. The way they cook the lentils, it takes on a slightly crunchy texture, and the subtle tastes are best before the other spices in the rest of the dish. The chickpeas and fava beans combination was also lovely, as was the falafel that makes anything in the East Village make me chuckle. The plate comes with a salad, but is also loaded with fresh olives and pickles which are almost an overload of goodness by the time you finish (and one person never can finish the whole thing). I washed the whole thing down with one of my favorite Turkish drinks, Tamek ($1.50) in the sour cherry variety. After eating so much, the wonders of the grocery store all around and below you recede to the background, although definitely are worth exploring in their own right. 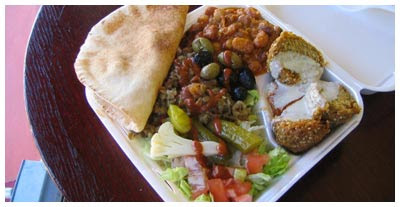 The place really tries to tackle too many places, with North African, Middle Eastern, and South Asian spices, imports, and foods all represented.